Dr. Patrick D. Gallagher was confirmed as the 14th Director of the U.S. Department of Commerce's National Institute of Standards and Technology (NIST) on Nov. 5, 2009. He also serves as Under Secretary of Commerce for Standards and Technology, a new position created in the America COMPETES Reauthorization Act of 2010. 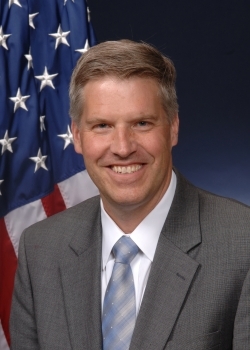 Prior to his appointment as NIST Director, Gallagher served as Deputy Director since 2008. Dr. Gallagher resigned his position on June 13, 2014. In addition to his NIST position, Dr. Gallagher was named Acting Deputy Secretary of Commerce on June 1, 2013. Beginning January 1, 2014, Gallagher’s title changed to NIST Director performing the duties of the Deputy Secretary, per government protocol. Gallagher will serve in both roles until President Obama nominates and the U.S. Senate confirms a Deputy Secretary of Commerce. Gallagher provides high-level oversight and direction for NIST. The agency promotes U.S. innovation and industrial competitiveness by advancing measurement science, standards, and technology. NIST's FY 2013 budget includes $778.0* million in direct and transfer appropriations, an estimated $49.7 million in service fees and $120.6 million from other agencies. The agency employs about 3,000 scientists, engineers, technicians, support staff, and administrative personnel at two main locations in Gaithersburg, Md., and Boulder, Colo. NIST also hosts about 2,700 associates from academia, industry, and other government agencies, who collaborate with NIST staff and access user facilities. In addition, NIST partners with more than 1,300 manufacturing specialists and staff at more than 400 MEP service locations around the country. Under Gallagher, NIST has greatly expanded its participation, often in a leadership role, in collaborative efforts between government and the private sector to address major technical challenges facing the nation. NIST’s participation in these efforts stems from the agency’s long history of technical accomplishments and leadership in private-sector led standards-development organizations and in research fields such as manufacturing engineering, cybersecurity and computer science, forensic science, and building and fire science. Currently, he co-chairs the Standards Subcommittee under the White House National Science and Technology Council. Gallagher joined NIST in 1993 as a research physicist and instrument scientist at the NIST Center for Neutron Research (NCNR), a national user facility for neutron scattering on the NIST Gaithersburg campus. In 2000, he became group leader for facility operations, and in 2004 he was appointed NCNR Director. In 2006, the U.S. Department of Commerce awarded Gallagher a Gold Medal, its highest honor, for his leadership in interagency coordination efforts. Gallagher received his Ph.D. in physics at the University of Pittsburgh and a bachelor’s degree in physics and philosophy from Benedictine College.